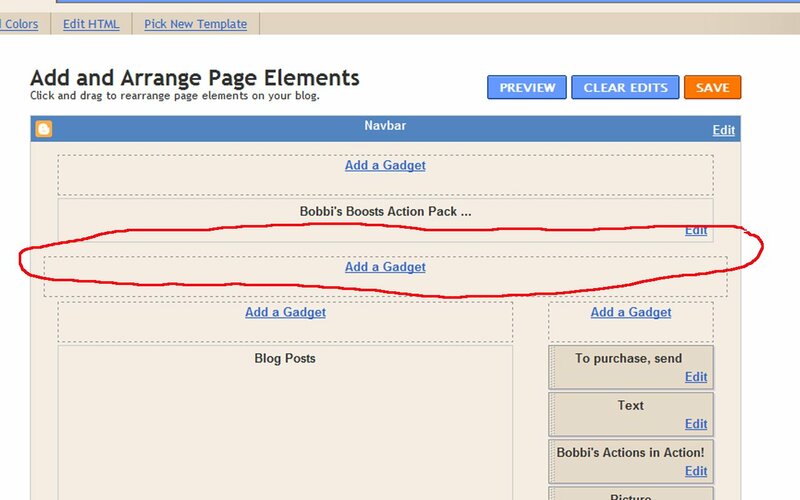 Tutorial – Adding a Menu Bar to Blogger – It Works For Bobbi! Published on November 12, 2008 August 9, 2016 by Bobbi-Jo G.
Okay, has ANYONE noticed my awesome menu bar on my blog? Am I the only one totally impressed by that? LOL! Okay, okay, it’s not so awesome, I know, but I felt so brilliant for figuring it out! YES! And, since I hate being brilliant alone (hardy har har) I have to share, share, share with my closest friends!! 1. First you need to create some buttons in your photo editing program. (I did mine in photoshop). You first need to know how wide your banner is. 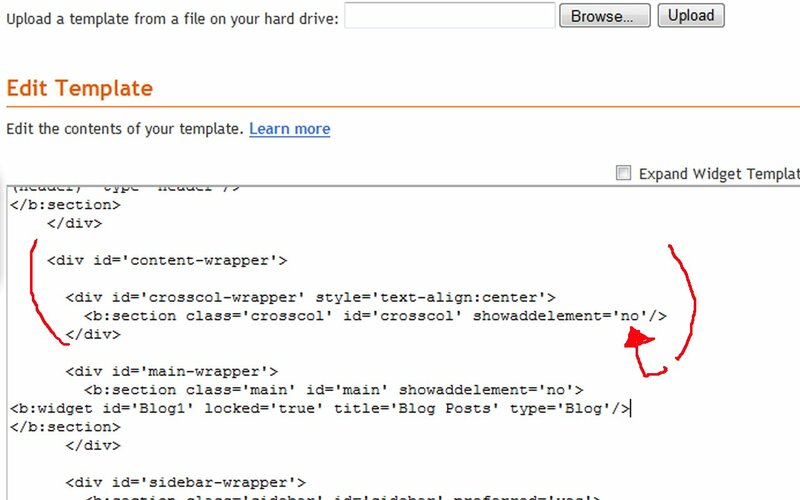 One way to do that is to open your blog, right click over the banner, save the file, then open that file in photoshop. 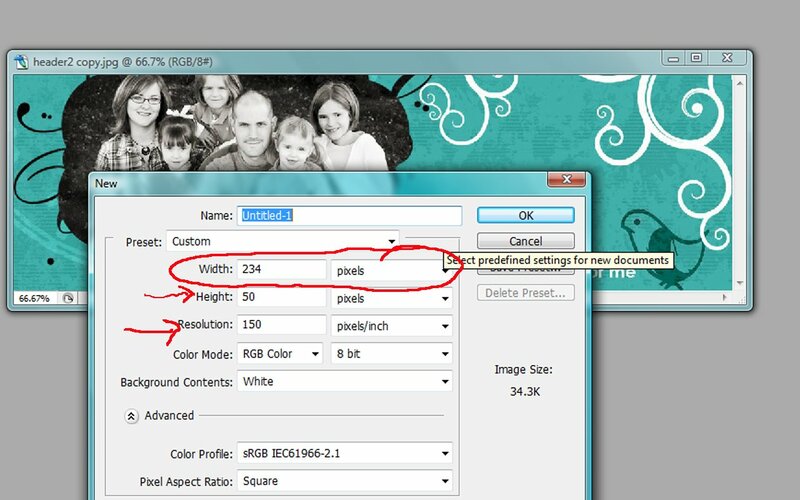 Once your banner photo is open in photoshop you can go to Image>Image Size (Alt+Ctrl+I) and look at the width of your banner. Then, divide that number by how many buttons you are making. For example, my banner is 1170 pixels wide. So, since I wanted to have 5 buttons, I would divide 1170 by 5 and make each button 234 Pixels wide. You can decide how tall to make your buttons. 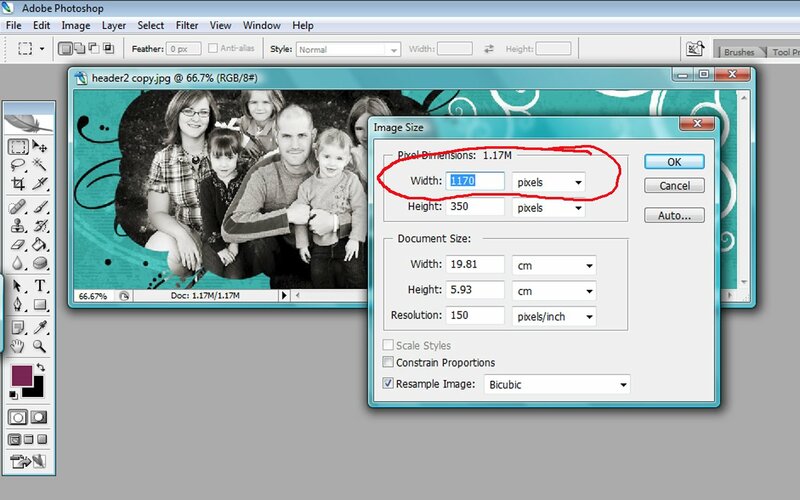 So, create a new file (File>New) and enter the custom settings of how big you want to make your buttons. In my case, I am making my buttons a width of 234 pixels, a height of 50 pixels, and a resolution of only 150 pixels/inch (this is just for the web, after all). Click OK.
Design your button however you choose. Be as creative as you want. 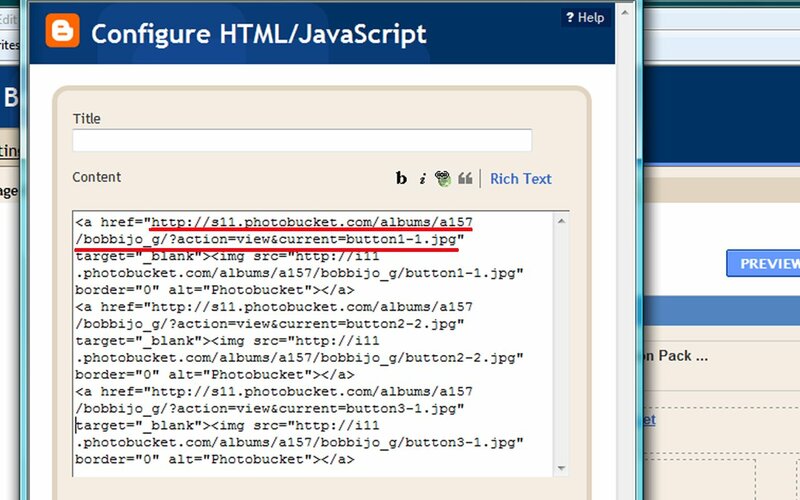 When you are done, save your button as a jpeg file and repeat the process for each button. 2. 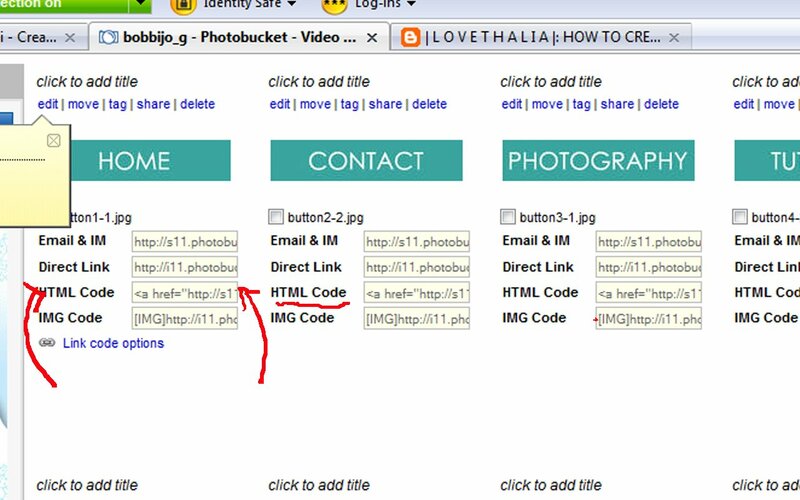 Upload your button images to a site like photobucket (or your favorite image hosting site). Okay? Okay. 3. Now is the tricky part. Just follow along closely and you’ll be fine. 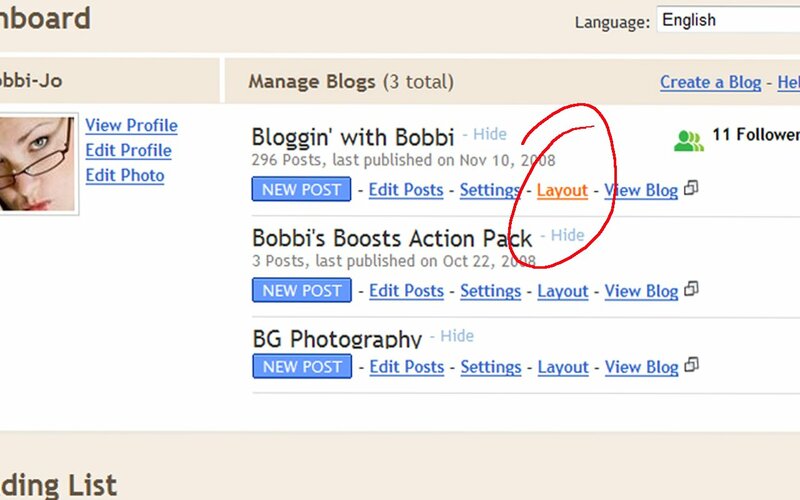 Open your dashboard to your blog. Click where it says LAYOUT. 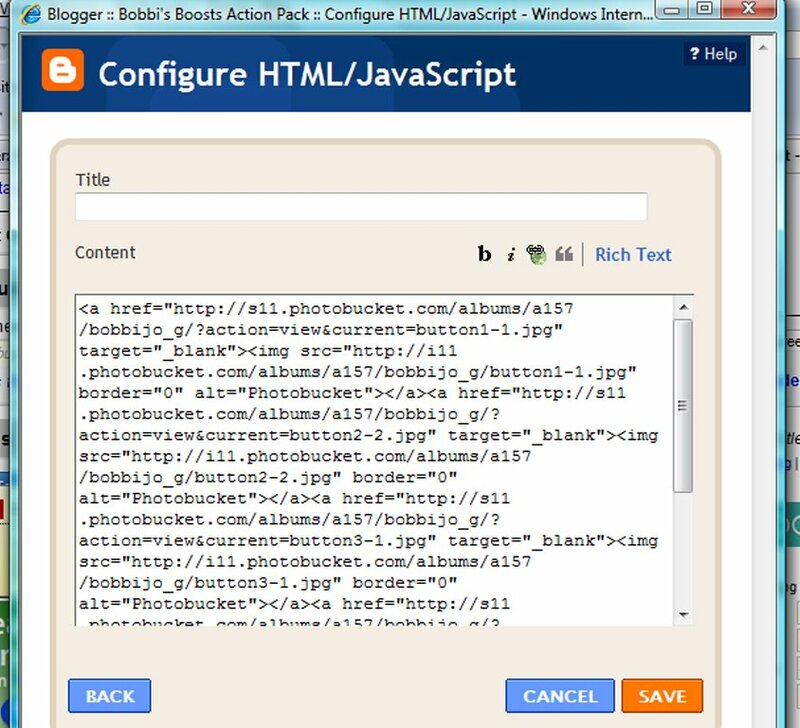 Then click where it says “Edit HTML” and you’ll see a page like this (you’ve probably seen this page before). Now, at this point, I need to remind you to save a copy of your template, just to be safe. 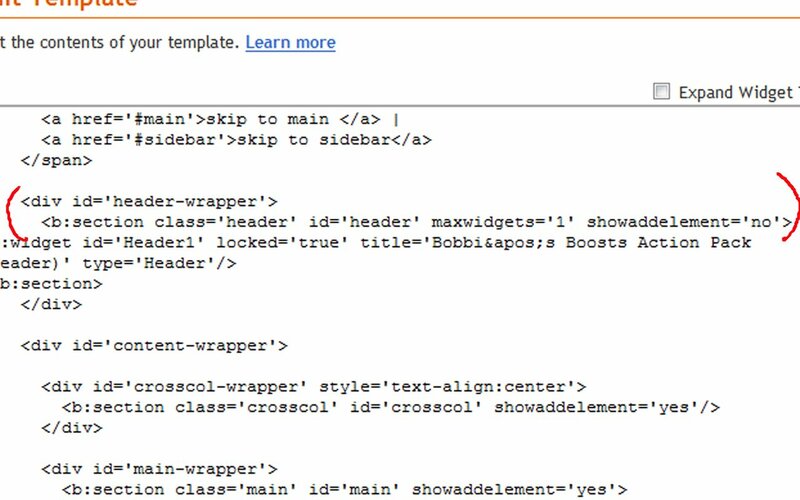 You don’t want to mess with the HTML code without saving your original template first. Okay, now that the disclaimer is over…. It’s the bit of code beneath the header-wrapper bit. What you are going to do here is change the number beside “maxwidgets” from 1 to 2. Now, change the ‘no’ beside “showaddelement” to ‘yes’. Did that make sense? It’s the bit after ‘main-wrapper’. Change the showaddelements to ‘yes’. Almost done! It’s the bit after ‘content-wrapper’. Change showaddelement to yes . That’s it. NOW you’re done with this page. 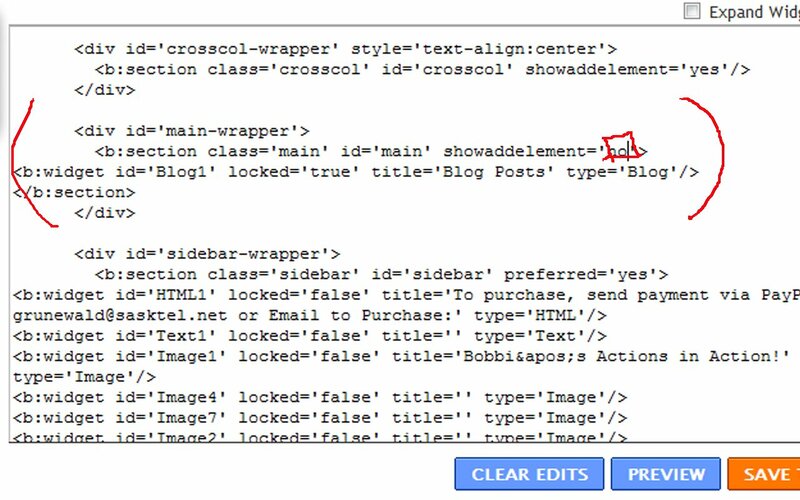 You should now have an ‘Add Page Element’ option between the Blog Title (header) and the blog post section. 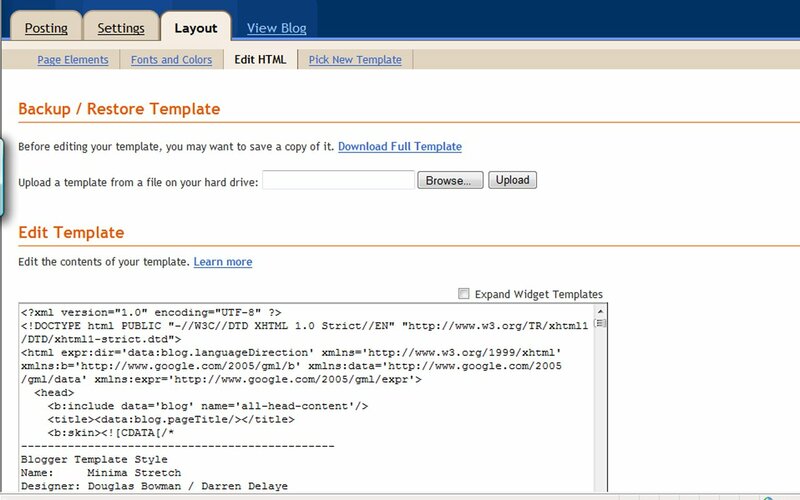 Click “Save Template” and then click on “Page Elements” on the top of your screen. 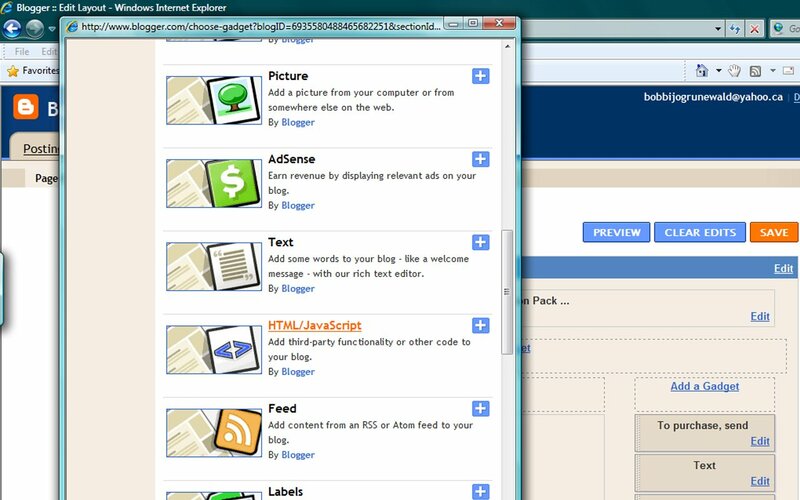 This will take you to where you can see your blog layout, and add some elements. You should see a bar under your header where you can add a gadget now! 7. The last thing we are going to do is center the buttons by entering (with no spaces) at the beginning of the code (the top of the box) and (with no spaces) at the very end. That will center all of the codes in between. 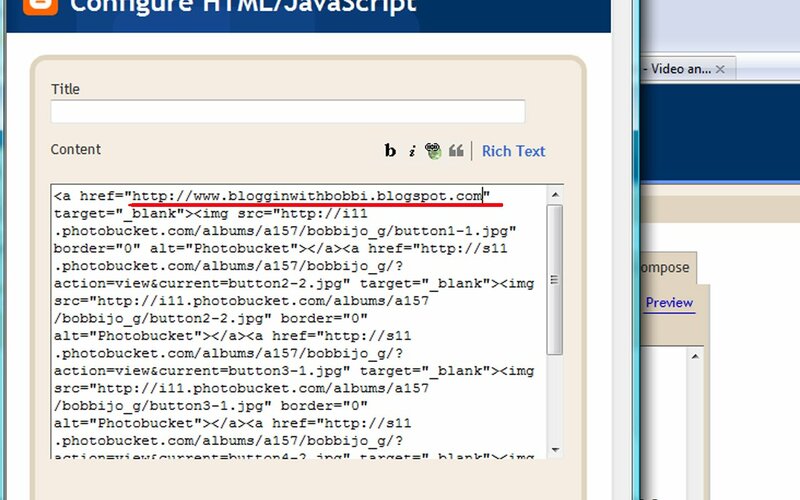 Click SAVE and then check out your blog! Enjoy your menu! Oooooo, ahhhhhhh! Wow… that’s GREAT! Thanks for such great instructions! Now, am I brave enough to try it? I’m so in love with this!! I may have to try it! I’m not scared of HTML!! ;):) Thanks for the VERY INFORMATIVE TUT!! I’m so going to try this!!! Thank you SO much!!! WOW! Thank you!I have a question, have you seen on any photographers blogs how they put digi scrap paper on the wall as the backdrop? I don’t know if that makes sense or not…somehow they cover the wall in P.S. with the paper. I want to know how to do it if you know! You are soooo stinkin’ talented! I’m glad I have my hubby to do these things for me!! 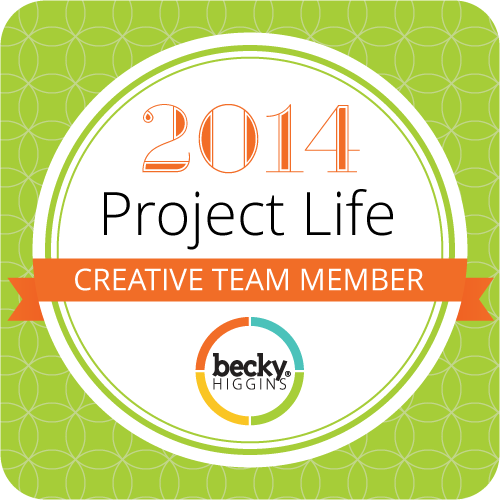 !Thanks for sharing Bobbi! i WAS WONDERING HOW YOU DID THAT YOU LITTLE SMARTY PANTS!!! I just hooked this up over at girly do’s— thank you! Thank you for taking the time to show us how to do this! You ROCK!!! This is fab! I would definitely try this one, thanks for sharing! Thank you, thank you, thank you. I’ve been trying to figure out how to do it. I think it looks so professional on one’s blog. And now mine can be like that too.You’re so sweet for sharing (taking the time to do that too). THANKS! I'm def. going to do this…been wondering how for months…and just gave up. I just happened across someone else's blog that had a menu and I was like, “HOW'D you DO that?” They directed me here! 🙂 Wonderful information! I paid to have my blog redone and she did make my menu bar with drop down menu, however, when it messed up and reverted back to the way it was before she added the html code – with just the pages listed, I haven't been able to fix it and she doesn't mess with it after making it. Maybe now I can fix it. I hope.